With only around 1200 cars sold in the US through 1980 and 1981, it’s fairly rare to find a Rover SD1 for sale. However, if they were going to survive anywhere, it would be the west coast. Sadly, most remaining examples have fallen into decay, which is somewhat surprising given the American-based V8, good handling and arguably the most elegant 4-door sedan styling of its time. And here we have two projects which, when combined, will never almost certainly make one fantastic driver. Even better, you could make a good driver out of the good parts, and a BTCC-inspired LeMons racer from what’s left – what could possibly go wrong? Find the most complete car for $1500 in Long Beach, CA. With a meager 133 hp, you’ll be relying on torque to pull you along in this engine. Before you get all outraged about how a V8 could have so little power (about 20hp more than an Alfa 4-cylinder of the period), the contemporary and much larger Ford 5.0 had only 140hp. No doubt it’s been done in the Rover’s home country, but has anyone here in the US upgraded to a later Land Rover Discovery or Range Rover engine? They were produced until about 2003, so ostensibly would be an easy upgrade to 188hp (4.0) or 225hp (4.6). Fancy that with a manual shift! 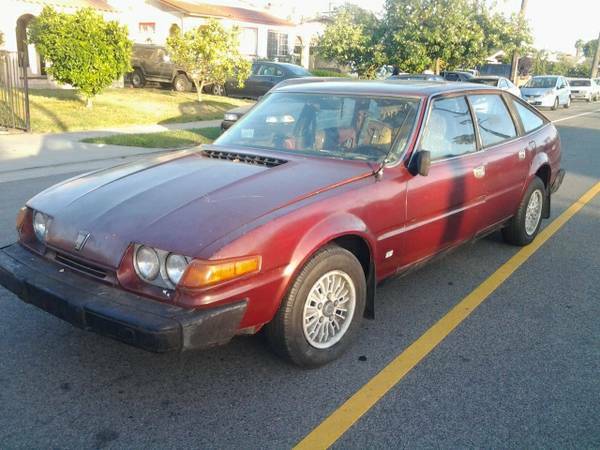 Anyway, if that wasn’t enough, there’s a second SD1 for sale in Los Angeles. With a bit of negotiation, this one could actually be the better deal – it has a new interior, rebuilt engine and new brake master, all waiting to be installed. There is a bit of rust under the rear window, but that repair could be postponed. Please post back if you’ve seen an engine upgrade on one of these. This entry was posted on August 22, 2013 at 9:06 am and is filed under Feature. You can follow any responses to this entry through the RSS 2.0 feed. You can leave a response, or trackback from your own site.